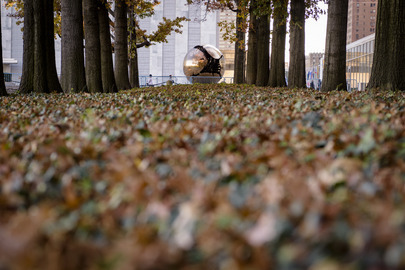 A view of the sculpture "Sphere within a Sphere" by Italian sculptor Arnaldo Pomodoro, located at the Visitors' Entrance to the UN Headquarters. The work was presented as a gift to the UN from Italy in 1996. In the foreground lie fallen autumn leaves resting atop hedges.